Dreamcast® compatible. Looks, feels, and performs just like the original. NEW HIGH QUALITY S- VIDEO CABLE FOR THE SEGA DREAMCAST SYSTEM MADE BY performance. THE AV VIDEO CABLE HAS 2 AUDIO & 1. Can not be used for an AV cable. S VIDEO connection. NON CONTINENTAL USA AK / HI / PR / APO / FPO / & OTHER US TERRITORIES. Dreamcast System Cable S-Video & AV (Retro-Bit). Compatible wit Dreamcast. Works with AV ready TV's. 4 out of 5 stars - S-Video AV Cable for Sega Dreamcast System "New"
10 product ratings10 product ratings - S-Video AV Cable for Sega Dreamcast System "New"
NEW S-VIDEO CABLE FOR SEGA DREAMCAST. THIS CABLE HAS 1 S VIDEO CONNECTION AND 2 RCS AUDIO VIDEO CONNECTIONS. THIS CABLE WILL NOT WORK FOR ONLY RCA AUDIO VIDEO CONNECTION THE TV MUST HAVE AN S VIDEO INPUT. The cable has L/R RCA Audio connectiors and a Composite video/single S-Video connector. Compatible with DreamCast System. Compatible with TV with S-Video and AV Ready Input. Sega Dreamcast Official S-video S video Cable high quality! This is a very rare cable. Sega Dreamcast Official S-video S video Cable USA SELLER. Condition is Used. Shipped with USPS First Class Package. You can use either as a standard AV cable (YELLOW) or an SVideo AV cable. 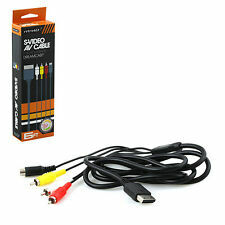 NEW HIGH QUALITY AV AUDIO VIDEO CABLE & S VIDEO CABLE FOR THE SEGA DREAMCAST SYSTEM. THE AV S VIDEO CABLE HAS 2 AUDIO & 1 VIDEO RCA CONNECTIONS AND 1 S VIDEO CONNECTION. Dreamcast® compatible. We are committed to serving the gaming community. You may also be interested in. Dreamcast HD SVHS S-Video Adapter Audio Video Composite AV Cable New! for Sega! 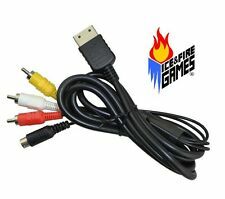 SVHS Audio Video cable-6 foot cable to connect your dreamcast to any compatible vcr or tv An excellent gift for any collector! Compatible with all Dreamcast systems in all countries! Also when plugging it into your Dreamcast system you must grip the plug end carefully andnot the cable. Features: 100% brand new and high quality Compatible with All Sega Dreamcast Consoles Make playing your favourite console even easier with a new AV cable. Enjoy better picture quality on modern TVs than with traditional RF connectors. Ultra thick and flexible jacket with colour coded connectors for easy installation. No contrast issues that are common with lower quality AV cables. Simply connect to your console and plug the red / white / yellow (RCA) connectors into your TV. 4 input AV / S video 1 output. Muddy moose Trading co.
Enquiped Aniti interference (RH core). Compatible with all Dreamcast console. NTSC/J, NTSC/US/Canada and PAL consoles. Mid East 14 ~ 21. 3RCA Audio Video AV Cable Cord Sega Saturn. - Compatible with Dreamcast. 1 x S-Video Cable for Dreamcast. S-AV Cable for Dreamcast. - Works with AV ready TV's. AV RCA Cable Lead Cord Composite for Sega Dreamcast DC. Flick the switch to select standard TV or VGA. So no need to reach behind and unplug cables when you want to change between your standard TV and VGA monitor! Just leave it all connected up and flick the switch.Works on all versions of Sega's Dreamcast console. 1Piece AVS Cable. 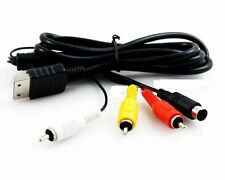 - AV S Video Audio Cable Compatible with Sega Dreamcast/DC 128. - Cable Length: 6ft / 1.8m. - Transfers Video and Sound to a display via composite RCA connectors. - Hook your old gaming console to your RCA compatible TV with this adapter. Supports S-Video or AV output. 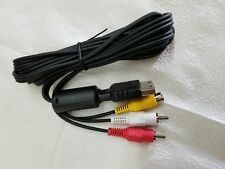 AV S Video Audio Cable Compatible with Sega Dreamcast/DC 128. - Cable Length: 6ft / 1.8m. - Transfers Video and Sound to a display via composite RCA connectors. - Hook your old gaming console to your RCA compatible TV with this adapter. Sega Dreamcast S-Video cable. Better picture than using an AV or RF cable. NEW and Boxed. This cable provides the highest quality picture available to even the most modern TV's. 1x Premium S-Video Cable. 1.8m or approx 6ft long cable. Ultra thick jacket for premium performance. 1 YEAR WARRANTY. Includes: 1 DC SAV Cable. Platform: Dreamcast. Enjoy enhanced audio and video. 1 pcs cable. Improve your picture quality. Color: Black. Nintendo DS. Nintendo Wii U.
Enquiped Aniti interference (RH core). Works just like a Dreamcast VGA BOX. Compatible with all Dreamcast console. NTSC/J, NTSC/US/Canada and PAL consoles. Location no. AV S Video Audio Cable Compatible with Sega Dreamcast/DC 128. - Transfers Video and Sound to a display via composite RCA connectors. - Hook your old gaming console to your RCA compatible TV with this adapter. Platform: Sega Dreamcast. Length: 6 feet. Platform: Sega Dreamcast. Type: A/V Cable. A/V Cable Connection: S-Video. condition: New. Dreamcast System Cable S-Video & AV (Retro-Bit) "NEW"
Compatible wit Dreamcast. Works with AV ready TV's. 4 out of 5 stars - Dreamcast System Cable S-Video & AV (Retro-Bit) "NEW"
10 product ratings10 product ratings - Dreamcast System Cable S-Video & AV (Retro-Bit) "NEW"